What's Your Economic Doomsday Plan? But Where Are The Teeth? Thanks to the reader for this piece on becoming effective (in a practical, not a paper-punching, sense) at long range with your sidearm. It might be all you have, for a while at least. Than you for the reference. I've been working on long(er) ranges with my 686 w/6" bbl. I'm out to consistently hitting 8" plates at 120 yards. I guess I still have a ways to go yet. Guy I knew loved to hear people criticize the Government Model .45's loose tolerances and inaccuracy. He'd put a clay pigeon on the 100-yard berm and take bets whether he could hit it or not. Then he'd break it on his third shot. Remember the Union general whose last words were "Don't worry, they couldn't hit an elephant at this dist--"
I used to read Elmer Keith when he was still alive and kicking. 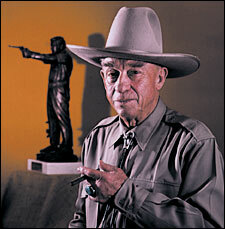 Interesting guy, worked with Smith & Wesson to create the .44 Magnum and so forth. He shot long range with a large bore, single action revolver from a supine position, bracing the piece on his leg. More personally, I used to shoot gophers in Montana with my 9mm Browning Hi-Power, not successfully more than about 10% of the time, but still, the buggers are only six inches tall when they're standing, and at 70-100 yards, not easy to hit. Great Point. Yes you can shoot targets at 300 yards with your side arm. I entered a rifle muzzle loading competition with my pistol (lack of a rifle) for fun. 20 targets, 20 shots. It started with the closest first, then progressed out to 300 yards. I missed the majority of the targets, however, as I was missing I was learning my 1860 army's trajectory. By the time I made it out to 300 yards, I had a good feel for it.When the last shot left the barrel, I turned to my friends as if I missed, and ........... DOOONGG went the old oxygen tank at 300 yards. Big Smile! From then on I started shooting my 9mm with similarly impressive results. Its a lot of fun - try it sometime. What kind of foot-pounds are you delivering at long range from a carry-length barrel? Re the KE question, your "I won't volunteer" point is the relevant one, methinks. I'd much rather know where my .40 hits at 100/200/300 with duty ammo prior to exciting times. I carry a TT-33 daily and while I know that's not for everyone, it certainly makes a great car/truck gun. There is no holdover necessary at 100 yds and only a couple feet at 200. And it still means business when it gets there. Thats a good article - thanks for linking to it. The more you know about your handgun is always good information to have.